It is every parent’s dream that their child will one day devour books like they do candy. Reading can be one of the most magical gifts a child can get, but in this day and age many children would rather sit at watch television or play a video game instead. So how do you encourage your child to pick up good ol’ Harry Potter and enjoy it too? First, we need to take a look at what is stopping your child from enjoying books. When a child has a distaste for reading, it can be disheartening for the parents. Reading is an influential part of growing up! But, finding what is causing this distaste and trying new and positive methods, your child will be an avid reader in no time! Why Does My Child Hate Reading? The unfortunate fact is that not every child likes to read. A few of the most common reasons are include reading feeling like a chore, the child finds reading boring, book selections are too difficult, or the child just hasn’t found the right book yet! I assure you, this is not the end of the world. Once you discover the reason why your child is a reluctant reader, then you can very easily find ways to make reading more fun. In fact, here are seven methods to make your child love reading. Studies show that most book lovers start their love of reading before they could even read themselves. 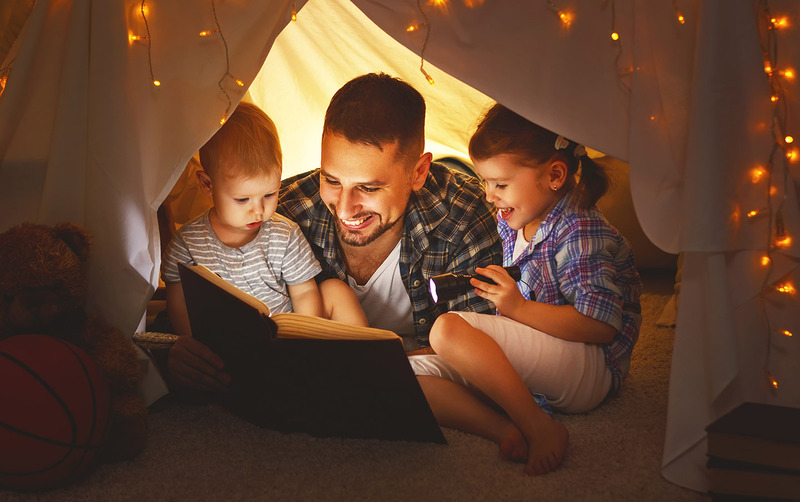 Reading to your child (even well after they can read solo) helps develop social skills, imagination, it makes learning a lot easier, and increases attention spans. Have you and your child created a dedicated space just for reading time? This could be as easy as a couch with a special blanket or even a blanket fort! Having a special area like this will help the child get in the right mood to jump into a book. It will also limit distractions from the world around them. Show your child the importance of reading by picking up a book or newspaper yourself. Children are constantly watching and following their role models. If you make reading an important part of your life, chances are your child will follow suit. Something I have seen countless times as a Bookmans employee is a parent recommending books that they read when they were younger. Children in this scenario often shut down these recommendations. Your child might not like the Hardy Boys or Nancy Drew as much as you did when you were their age. Instead, try recommending something more modern or let them pick what looks good to them. This step might be one of the most important. Find out what books are trending! Children might not listen to their parent’s recommendations, but they sure will listen to what the other kids say is popular! Some popular books may include Dogman by Dav Pilkey, Diary of a Wimpy Kid by Jeff Kinney, Smile by Raina Telgemeire, or Goosebumps by R. L. Stine. You can bring books almost anywhere! Have a long car drive ahead of you? Have your child bring a handful of books to keep them preoccupied. Waiting in a long line? Books can be the perfect way to pass the time. Any excuse to pull out a book is a good excuse. Give your child a reward if they finish a book. Even better, WE will give your child a reward! If your child reads ten books, writes ten book reports (a few sentences on what they liked from each book), and brings the reports to Bookmans, we will give them $10.00 in-store credit for their hard work! There’s also the Bookmans Kids Club which parents can sign up for that will earn your little ones a 10% discount on all things in our stores, including books!